Dyersville is known as the Farm Toy Capital of the World. It is also home to the famous "Field of Dreams" movie site. It is mostly a farming community with several manufacturing/distributing companies located here as well. There are several dining options here, including family style home cooking, Mexican, sandwich shops, coffee shops, locally owned restaurants and several pizza and fast food establishments. There are several parks that are available for pleasure and sporting use. 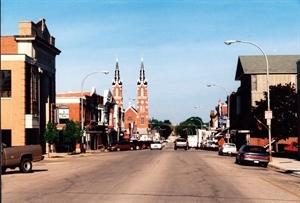 Dyersville offers many activities. There is a new walking/running trail in town. We are on the west end of the Heritage Trail, which runs 25 miles to Dubuque. A municipal swimming pool, baseball diamonds and soccer fields are available. There are two fitness centers in town as well as two bowling alleys. Two casinos are 25 miles away in Dubuque. Northeast Iowa Community College is 20 miles away in Peosta. There is a public as well as a private golf course in town. One of the local hotels has an indoor swimming pool that is available to the public. The town hosts two major farm toy shows throughout the year as well as outdoor music events. The James Kennedy Public Library is a award winning library. It offers programs and events for all ages at any given time of the year. The National Farm Toy Museum is a nationally known museum which tells the history of agriculture as well as offers displays and interactive exhibits. The Dyer-Botsford Historical House is home to a collection of over 100 dolls and is decorated in the time period of James Dyer, the founder of Dyersville. Dyersville is 25 miles from Dubuque Regional Airport. Mercy Medical Center-Dyersville is affiliated with Mercy Medical Center-Dubuque. Jan 8.0 F° 17.0 F° 26.0 F° 0.9 "
Feb 13.0 F° 22.0 F° 31.0 F° 1.2 "
Mar 24.0 F° 34.0 F° 44.0 F° 1.8 "
Apr 35.0 F° 46.5 F° 58.0 F° 3.5 "
May 47.0 F° 58.5 F° 70.0 F° 4.3 "
Jun 57.0 F° 68.0 F° 79.0 F° 5.2 "
Jul 61.0 F° 72.0 F° 83.0 F° 4.9 "
Aug 58.0 F° 69.5 F° 81.0 F° 4.8 "
Sep 48.0 F° 61.0 F° 74.0 F° 3.3 "
Oct 37.0 F° 49.0 F° 61.0 F° 2.9 "
Nov 26.0 F° 35.5 F° 45.0 F° 2.4 "
Dec 13.0 F° 22.0 F° 31.0 F° 1.4 "
Summers are warm for baseball, swimming and hiking. Fall is beautiful as the trees turn colors and the air is crisp. Winter is great for snowmobiling. Spring has an abundance of flowers, trees and the grass greening up. Condos Over 50 Communities Dyersville offers single family homes, apartment complexes, assisted and independent living centers, condos, a nursing home, and affordable living arrangements. Home care Senior center Visiting nurses Services for seniors include Home Health Aides, a very attractive and active senior center, transportation for seniors and a Visiting Nurses program. Volunteer opportunities are plentiful in this area. The hospital, schools, churches, and other service organizations use volunteers on a regular basis.